JACKSON HEIGHTS — The owners of a tiny Tibetan restaurant have opened a second branch across the street, featuring more seating and an expanded menu, including hearty soups for winter. The owners of Friends Corner Cafe opened Spicy Tibet last week, across from their restaurant on Roosevelt Avenue near 75th Street, according to employee Janchup Bhutia. The original space is known for its cramped quarters and long lines, so the owners began looking to expand, she said. They saw an opportunity when the former Pizza Don restaurant across Roosevelt closed a few months ago. "They couldn't expand there, so they opened here," she said. 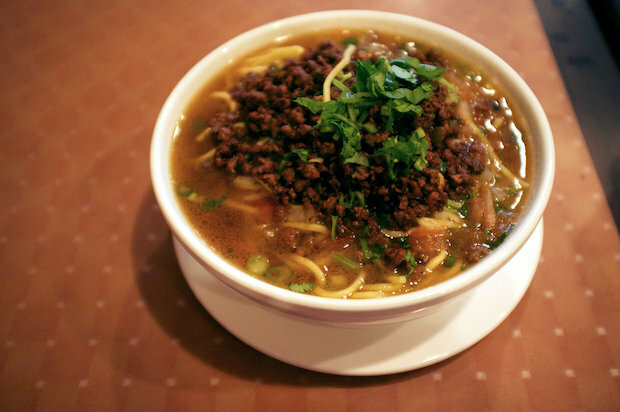 Spicy Tibet has the same favorites as Friends, including its momos, egg drop soup and gya-thug, a noodle soup covered with ground beef. But more items have been added, like potato chips chili, a spicy potato dish, an "American" chopsuey and more soups — like a hot and sour soup and sweetened corn soup. For the meat lovers they have dropa khatsa, a tripe dish marinated in spices, and gyuma, which are sausages stuffed with beef blood. A self-serve carafe of butter tea is available at the front, and Bhutia said they expect to have free delivery starting in January 2015. Spicy Tibet, 75-04 Roosevelt Ave., is open seven days a week from 9 a.m. until midnight.